Semana Santa (or Holy Week—the seven days leading up to Easter) is Antigua’s most celebrated religious event. Over the course of the holiday (and throughout the season of Lent), locals and visitors flood the city’s streets for religious processions, holy vigils, and other Easter events that take place at all hours of the day. There’s a lot going on, and it helps to stay somewhere central—so long as you’re guaranteed a quiet night’s sleep. 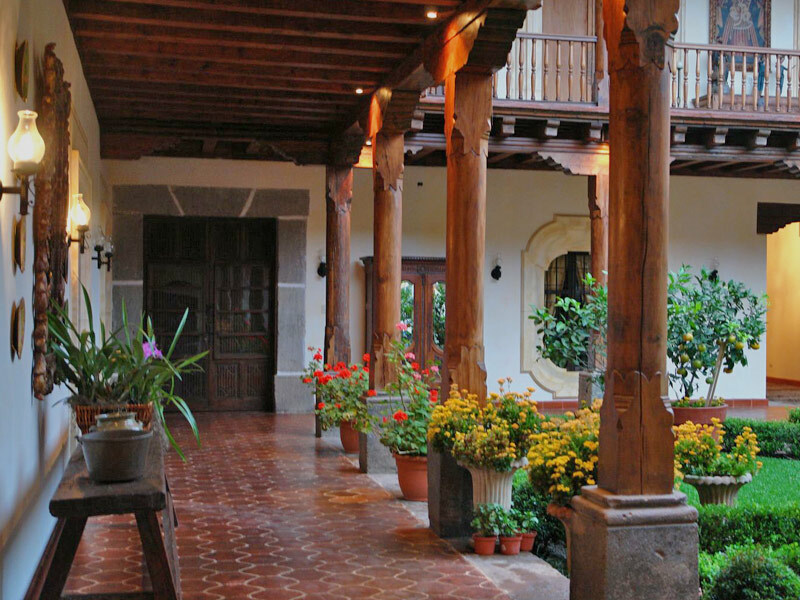 Fortunately, Hotel Palacio de Doña Leonor offers the best of both worlds: It’s in a great location and provides a decadent respite from the hullabaloo. Built in the 16th century by Doña Leonor, the daughter of Spanish conquistador, Pedro de Alvarado, this mansion-turned-boutique hotel is located just a half-block away from Antigua’s central park. Thirteen ornately decorated colonial-style rooms—each named after one of Doña Leonor’s family members—are situated around a lush, quiet courtyard. Outfitted with antique furniture, all of the rooms are distinct; you’ll find hand-painted ceilings, carved four-poster beds, glittering chandeliers, and rare orchids (the hotel has its own orchid greenhouse). Each bathroom has a shower and a tub and is stocked with rose-scented soaps, shampoos, and lotions from La Tienda de Doña Gavi, a local Antigua shop. Four of Doña Leonor’s rooms have second-story terraces overlooking 4a. Calle Oriente, a street along which all of the Lenten religious processions pass. These rooms offer a birds-eye-view of the Easter alfombras (sawdust carpets) that locals make, as well as of the andas (giant wooden depictions of Jesus and Mary) that people carry through the streets. Noise-abating windows help keep the rooms quiet, despite the bustle below. Hotel manager Levyi Córdova Castillo recommends reserving these rooms for Good Friday, in particular. “That’s when you see some of the most beautiful carpets, as well as the La Merced church procession—one of my favorites,” she says. If you’re traveling with a group—say up to five people—opt for the Don Pedro suite, which accommodates two. In addition to street views, it has a sumptuous sitting area and also connects to Doña Isabela (suitable for up to three) via a short private corridor. Doña Leonor’s street-facing suites go fast, and Levyi recommends making reservations up to one year in advance. If you can’t snag a room with a view, though, don’t fret. Simply reserve another one of the bedchambers and head to the hotel’s cozy bar when the processions pass. From the bay windows there, you can watch the sights with a camera in one hand and a martini in the other.